Low foot arches and flat feet can be particularly painful when you’re not wearing the right shoes. If your shoes don’t offer the correct motion control, you can experience overpronation, which can lead to stress on the knees, hips and back. Use the links above to jump ahead. We’ll also offer a brief guide on low arches and other effects you may experience with flat feet. 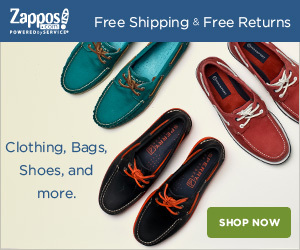 Ready to start shopping for the best flat feet shoes right away? Use our Quick Buy Guide below! However, if time is on your side and you want to learn more about the shoes, just scroll down to see more. If you have flat feet, one of the key features that you’ll need is motion control. In short, this corrects your stride so you don’t overpronate. 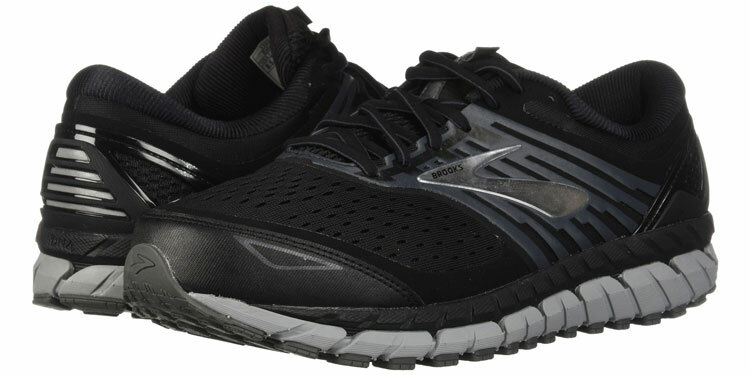 Out of all the shoes we tried, the Brooks Beast 18 offered the best performance with high-level cushioning and an external heel counter. Exceedingly casual to the point where these are more sportswear than daily shoes, they’re hard to integrate into a wardrobe. However, if your profession allows or even requires athletic footwear, you’ll be assured all-day comfort with these sneakers. If to be worn professionally, the black shoes with grey accents in the soles are your best bet. However, if you want something a touch flashier, the grey option is certainly worthwhile! Thanks to the memory foam footbed, wearers will experience rich cushion and support on the arches. Furthermore, the ankles are nicely locked in place to reduce pronation. In addition, the heel is made from EVA for shock absorption while the lightweight build prevent fatigue. Perfect for general business casual wear, the Breakaway is a versatile boot that can be worn in professional settings too. Depending on the colour, these can be worn with a suit or with jeans. Our favourite choice would be the reddish Cognac calfskin leather colour. However, the Onyx black is great for formalwear while the honey tan looks perfectly fine with casual attire. Another constructive approach to overpronation and flat feet is to focus on stability rather than motion control. Here, these sneakers from New Balance offer an ABZORB Crash Pad, which creates greater stability in the heel to correct your gait. However, it also provides motion control as well as high-energizing cushioning. As with the Brooks above, these are truly sportswear shoes. Furthermore, there aren’t any black or white options, which could make them passable in professional environments. However, if this is what you’re looking for, they’re the perfect companion for your feet. Available in various hues, we like the electric blue with some salmon accents in the eyelets and sole. However, there’s also a grey with blue and lime accents or light blue with lime and black accents. 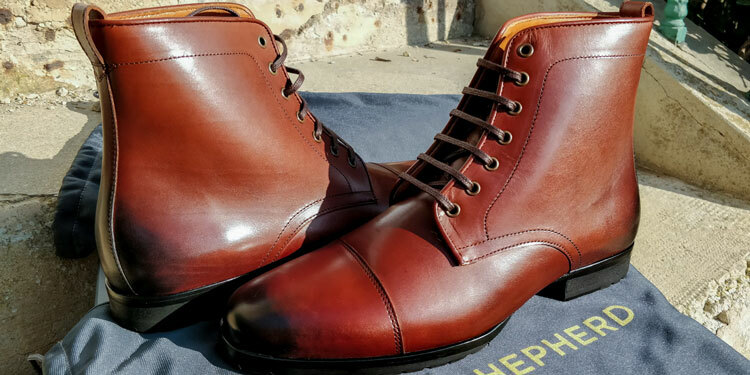 A classic shoe design, we’re big fans of Chukkas here at Bespoke Unit. Vionic are an American brand, which provide subtle orthotic shoes. These are no exception and are simultaneously stylish and comfortable with a removable EVA footbed designed by podiatrists. Ideal for both casual and business casual scenarios, these are great with chinos or jeans as well as a shirt and perhaps even a sport jacket. In any case, everyone will be non-the-wiser that you’re sporting orthotic-designed shoes. You can choose between either a tan or black leather, which are both water-resistant suede. We have an affinity for the tan leather, which is easier to style. Meanwhile, the black, for us, is a little too dressy given the shoe design. The bit loafer is a classic slip-on shoe that features a decorative metallic buckle across the throat, which resembles a bridle bit. 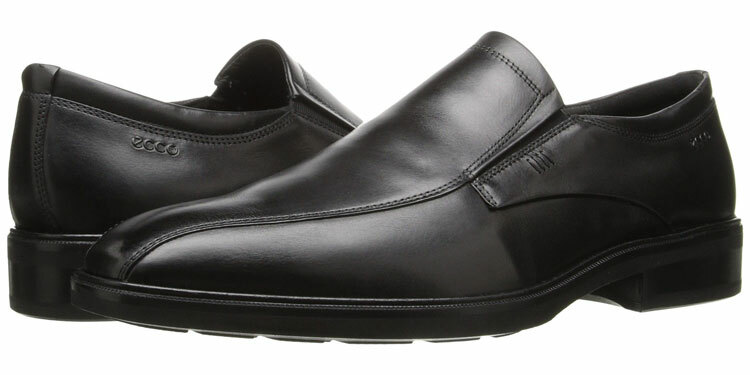 Also made by Vionic, these stylish loafers are seamlessly designed with orthotics in mind. 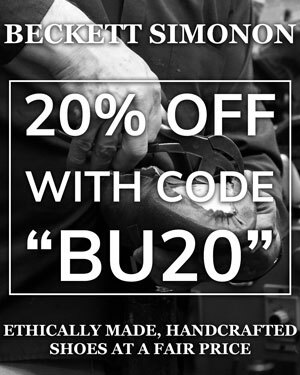 The same EVA footbed as the chukkas offer fantastic arch support as well as motion control for flat feet. Although a more casual shoe that can be worn with chinos or corduroy, you can probably dress these up for a more business casual look. 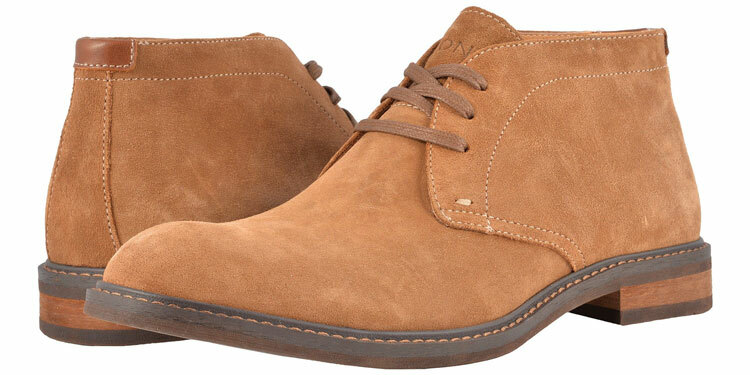 We like the idea of sporting them with jeans, an open-collar shirt and tweed jacket. Although available in black, grey and a tan brown, we’re only really fond of the brown. The black shoes are too dressy for the style and the grey suede would be a difficult colour to integrate in most wardrobes. Rockport is another brand known for making orthotic-friendly shoes. We love these brogues which feature an air chamber above the EVA footbed for extra comfort and cushioning. Perfect for business professional wear, we otherwise struggled to find any other shoes that suit this dress code while catering to flat feet. Nevertheless, these look great with a suit and tie whether you prefer modern or traditional tailoring. What’s quite unusual is that these brogues are only available in black. After all, brogues are usually made from brown leather. 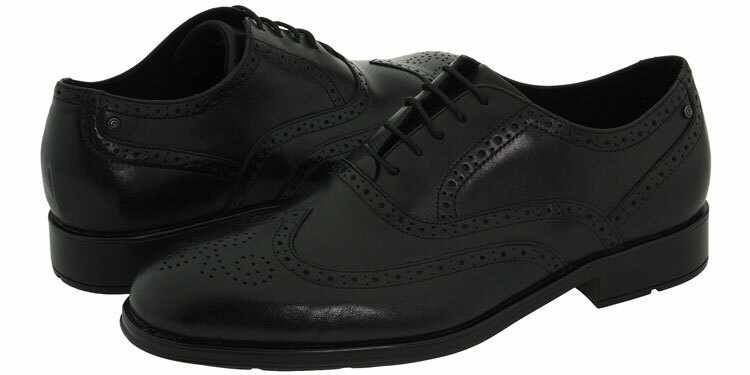 Nevertheless, they’re a very fetching brogue shoe that offers the comfort and correction you need if you overpronate. Birkenstock is a classic brand and firm favourite for providing comfortable footwear. However, did you know that they’re fantastic for flat feet too? As the contoured footbed molds to your foot shape, it provides a custom cushion and fit that ensures comfort throughout the day. 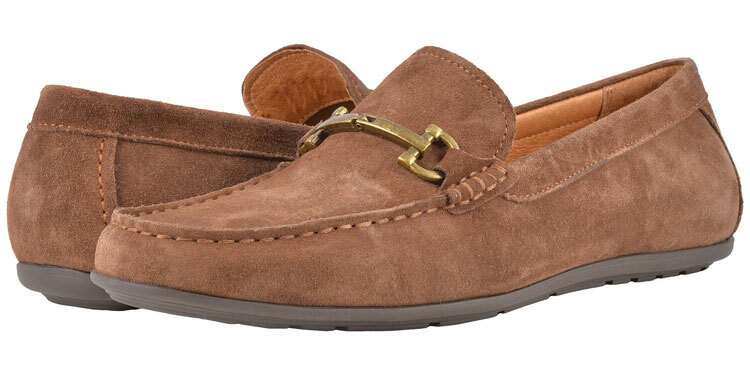 These are indeed very casual shoes but are great for the right occasion. Whether you’re in shorts during the summer or lounging around the patio, they’re very comfortable and feel great. Available in grey, black or tan suede leather, we’re more fond of the latter rather than the former two. Black is an oddly dressy colour for sandals whilst the grey can be challenging to style. Meanwhile, the tan colour has a natural carefree look about them. Ecco are renowned for providing comfortable footwear that’s office-friendly. The Illinois are no exception with a direct-injected PU outsole that ensures both stability and comfort throughout the day. Understated and classic in shape, these may not win any awards for style but are a very subtle and professional choice. If your line of work adheres to a certain dress code, these are a great option and look absolutely fine with a suit and tie. These loafers are available in both black and walnut brown. Whilst the walnut is great for wearing in more casual scenarios, the black leather is probably the better option for your day-to-day needs. If you have low arches but also enjoy walking activities, life can get pretty tough. Bruised arches can cut a long walk short so you need the right footwear. What we like about these is the in-built ESS shank for improved stability as well as a dual-density compression-moulded EVA midsole for support. Being Utilitarian footwear, your wardrobe is dictated more by needs rather than style. Therefore, just remember to check the weather beforehand and dress appropriately! Available in anthracite and gold, brown, black as well as an olive green suede leather, there are plenty of colours to choose from depending on your preferences. We’re torn between the olive green and anthracite. Flat feet and flip-flops may sound like an uncomfortable combination. 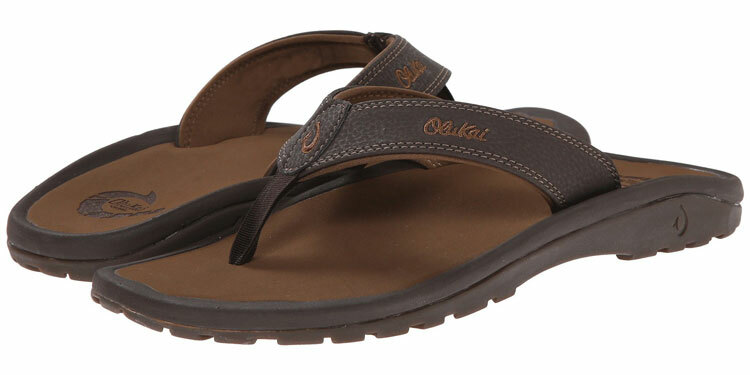 However, OluKai are renowned for creating very comfortable summer footwear. The Ohana is one of their most successful offerings, which feature an EVA footbed with compression moulding in the midsole for comfort and stability. Like the Birkenstocks above, these are shoes that you reserve for the summer. Whether strolling to the beach with a towel under your arm or just relaxing by the pool, they offer superior comfort and enjoyment. There’s a whole palette of colours to choose from! We’re fond of the Java and Ray brown flip-flops yet you could opt for olive green, blue or charcoal to name but a few! Your feet arches develop their shape through ligaments and tendons between the metatarsal and tarsal bones. They’ve evolved in such a way that the feet can support the entire body in an erect posture by spreading the weight. Furthermore, the arches of your feet act as natural shock absorbers, which guide your steps and the way your foot lands on a surface. As with foot sizes, the arch shape can vary between different people. Whilst the difference is usually quite small, there is a minority that can have fallen arches or even high arches. That said, as much as a third of adults can have flat feet. If you’re not sure what yours are, you can do what is known as a wet foot test. This simply requires you to walk across a surface with wet feet that leaves prints behind. You can then check the silhouette of your footprints and compare them with the graphic above. If you can see most of your foot, you likely have fallen arches. Whilst this isn’t quite a disorder, your feet may tend to overpronate, which means that they roll inwards when you walk. Overpronation can apply stress on your knees, hips and back. Therefore, if you don’t cater to it with the correct footwear, you could suffer from chronic pains as well as heel spurs. As with any arch type, the key is to support its natural shape with the correct type of shoe. Although this can be achieved with inserts or orthotics, some shoes are designed with low arches in mind. Motion Control: This feature usually stems from a heel design that ensures your feet land in the correct position when walking or running. Stability: Usually found in the midsole, stable shoes keep your stride in check by preventing them from rolling in or outwards. Arch Support: A featured found in the footbed’s cushion, the arches can vary in height. It’s important to find a comfortable cushion that doesn’t apply too much pressure on your feet. Often you’ll be able to find the right shoes that cater to your foot shape by simply perusing different options available online or in-stores. However, if your case is really severe, it may be worth seeing a podiatrist before the condition degrades even further. Having flat feet doesn’t stop you from undertaking the same activities as anyone else. As long as you have the right shoes that feet, you’ll be able to run just as far and for just as long as your arched brethren! Reviewed by Nabeel M., on 18th March . "THANK YOU SO MUCH! I have grown accustomed to having sore muscles/feet if I decide to go out or wear anything but runners so hopefully resorting to this will help!" Thank you very much for your feedback. If it’s okay with you, we’ll add it to the testimonial at the end of the page! Wolf & Shepherd deliver internationally so they may be worth checking out. I have slightly flat feet and the Breakaway boot has been a Godsend! If you want to read more about them, I wrote a detailed review. I will check out Wolf & shepherd. Thanks mate!